Spartacus Gladiators:tm is a strategy board game. Spartacus Gladiators:tm is played by 2 people. Ages to play is 8 to Adult. Playtime is about 30 minutes. The basic objective of Spartacus Gladiators is for each player to be first to move all his gladiators to the opponents end [Home Row] of the playing field. Spartacus Gladiators is played with one, six sided dice. One side of the dice is labeled “K”, one side of the dice is labeled “Q”, one side of the dice is labeled “H”, one side of the dice is labeled “B”, one side of the dice is labeled “C”, And one side of the dice is labeled “G”, “G” stands for “any Gladiator”. Gladiators can not be captured, but the Gladiators can be tagged. Tagging happens, when the opponent moves his playing piece on to a square that is being occupied by one of your Gladiators. When this happens your Gladiators has to be moved to the Dungeon. If it is a white gladiator it goes to the white dungeon, if it is a black Gladiator it goes to the black dungeon. The opponents piece stays on the square of the tagged gladiator. But if a gladiator is tagged on his “home row” square, then the tagged gladiator goes to the dungeon and the tagging gladiator goes to the “castle area” and is out of play. 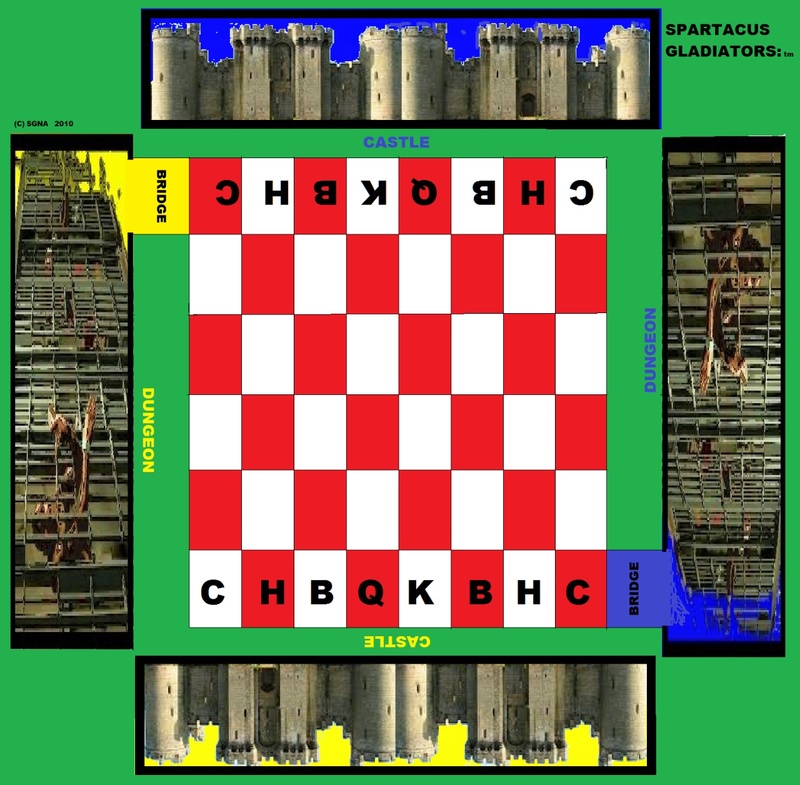 Spartacus Gladiators is played with black and white chess pieces (colors can vary).The pieces in this game are called “Gladiators” Each player at the start of the game receives, 1-King, 1-Queen, 2-Horses, 2-Castles, 2-Bishops. all the Gladiators in each players set are the same color. Place the board on a table. One player gets the top of the board and one player gets the bottom. High roll of the dice by the players, gets to make the first play. Each player is given his strategy gladiators. Then each player places his strategy gladiators on their, respective labeled squares. The first player to start the game, rolls the dice, and say a Castle rolls up, the player can then move his castle. Once a players gladiator reaches the opponents Home Row of the playing field; then that gladiator it is out of play and is placed in the “Castle area” behind the opponents home row. . A players gladiator can not move unless its identity is rolled up on a dice throw. Once a gladiator is tagged, it must be placed in the dungeon. The opponents gladiator stays on the tag square. In order for a gladiator to get out of the dungeon, its identity must be rolled up on the dice by the player. When this happens, the gladiator can move onto the bridge that connects the dungeon and the playing field and that is the players move for that roll. When a gladiator is on the bridge it can not be tagged. More than one gladiator can occupy the bridge at the same time. On any “gladiator identifying” roll a player can move a gladiator in the playing field or a gladiator that is in the dungeon to the bridge or move the gladiator from the bridge to the playing field to make a play . If a player rolls to a gladiator that is out of play, the player loses his turn and passes the dice the other player for a turn . If a “G” rolls up on the dice, the player can move any one of his gladiators that are in the playing field or bridge or dungeon. KING.... A King may move forward or backwards and may move horizontally, vertically or diagonally one square at a time to tag an opponents Gladiator or to make a strategy move; as long as it is a straight run without any playing pieces between the start and the finish of the move. QUEEN.... A queen may move forward or backwards and may move horizontally, vertically or diagonally up to the length or width of the playing board to tag an opponents Gladiator or to make a strategy move; as long as it is a straight run without any playing pieces between the start and the finish of the move. or to make a strategy move; as long as it is a straight run without any playing pieces between the start and the finish of the move. BISHOP.....A bishop may move forward or backwards and may move diagonally up to the length or width of the playing board to Tag the opponents gladiator or to make a strategy move; as long as it is a straight run without any playing pieces between the start and the finish of the move. HORSE..... A horse may move in any "L" shape on the playing board. A horse may move one square up and two squares to the right or the left or a horse may move two squares up and one square to the right or the left and they may move in any direction on the board. A horse may jump over other pieces during a move, in order to land on an empty square or to Tag one of the other players gladiators. The first player to land all his Gladiators on the “Home row” squares of his opponent at the opposite end of the game board by following the rules and place them in the “Castle area”, wins the game. The Gladiators landing on the home row do not have to be in the square labeled order.